Truth be told, we hadn't thought much about parapets before 10:15 yesterday morning, nor had much opportunity to use the word in our writing. Ever. 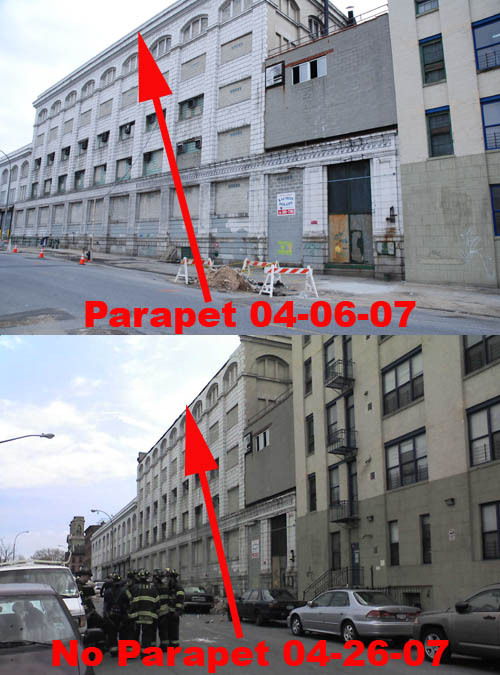 In any case, here's a little Ward Bakery before and after comparison, to give an indication of just how much parapet would have landed on your head had you had the misfortune to have been on Pacific Street around 9:50AM yesterday morning. We are certain that if you had been, your sacrifice via Ratner Parapet would not have been in vain.